You may have noticed that all of the people riding our bikes sit quite low to the ground; the benefits to this are immense and integral to our design. 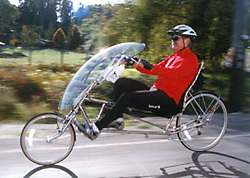 Numerous tests have shown that recumbent bicycles, like those made by Easy Racers, can be up to 30% more aerodynamic than traditional bicycles. As much as 80% of any cyclist's energy goes into overcoming air drag. Our riding configuration allows for a drastic reduction in wind resistance and thus rider fatigue due to these elements. A low center of gravity and longer wheel base yield unmatched stability. Sitting in an upright position allows our riders to have a sweeping view of the road ahead without straining their neck or drastically altering their posture. And when it comes time to stop, balancing is as simple as putting your feet down. Passing motorists are more likely to notice the moving helmet of an Easy Racers rider than the hunched-over back of a traditional road cyclist (they are essentially at the same height). Being at eye level with motorists is also a remarkable safety feature. An Easy Racer is definitely different, and different definitely gets noticed. Easy Racers aims to offer a bicycle for every type of rider, as well as options for those who are new to cycling. Most of our American made bikes are available in 9 different sizes and our Tour Easy frame has no weight limit. We also regularly fulfill custom orders for everything from tandems to motorized tricycles. Every Easy Racer is available with one of two model distinctions: Speed & Sport (SS) and Expedition (EX). Our SS models come equipped with a taller 451/20" front wheel for better handling at high speeds, road calliper brakes, narrow tires that offer lower rolling resistance, and higher gearing for an all-around fast ride. EX models, on the other hand, have the more common 406/20" front wheel, all-weather v-brakes, fatter tires with a more versatile tread pattern, and gearing akin to what you'd find on a mountain bike. EX models are great for touring, most types of commuting, and recreational cycling, whereas SS models are better suited for stronger riders and those who regularly traverse flat, smooth terrain. Most of the components we use come from the two industry leaders: Shimano and SRAM. We test all of the parts that we use on our bikes until we are certain of their quality and durability. If we have any doubts about a product's reliability we simply won't sell or recommend it. Easy Racers frames, handlebars, and seats are handmade at our Central Coast California factory. Many of the building techniques and rigorous testing procedures originated by company founder Gardner Martin are still used today. The EZ/Sun Recumbent Series bikes that we design and have available for sale on our showroom floor represent the best value in the recumbent market today. While built overseas, they retain many of the design features that have allowed Easy Racers to stay at the forefront of two-wheeled innovation for so many years.